More than 4.8 million Texans have cast early ballots in the state's 30 largest counties alone, an impressive tally that's within striking distance of the total number of ballots cast statewide during the last midterm elections in 2014. Data through Thursday from the secretary of state includes counties that are home to nearly 80 percent of Texas' population. That's compared to the 4.7 million-plus total ballots cast in 2014's top-of-the-ballot Texas governor's race. Through Thursday, Nov. 1, nearly 1.3 million North Texans have voted early in Dallas, Tarrant, Collin and Denton counties. The early voting total for the 2014 midterm for those counties was 548,511. 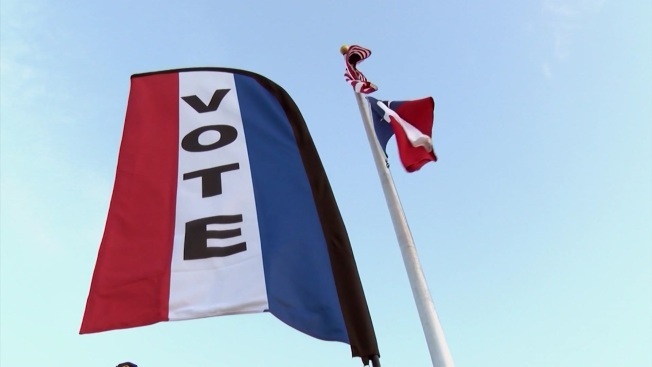 There's been a surge in voter registration in Texas this year with a record 15.6 million people signed up -- that is 1.6 million more than in 2014, during the last midterm election. About 400,000 people have been added to the Texas voter rolls since March, compared to about 100,000 added each year in the past. Texas have long voted early in greater numbers than on Election Day. Still, because early voting ends Friday night, early turnout in the top 30 counties alone may yet exceed 2014's total turnout. In the state's much-watched Senate race, both Republican incumbent Ted Cruz and Democrat Beto O'Rourke say strong turnout benefits them. Matthew Wilson, associate professor of political science at SMU's Dedman College of Humanities and Sciences, told NBC 5 both Republicans and Democrats may be spurred to vote early by recent events. "A major driver is that many Democrats have been seething with rage since President Trump’s election two years ago, and this is their first chance to vent that frustration at the ballot box. As a result, it’s not surprising that many were champing at the bit to cast a ballot as soon as the polling places opened. In addition, many Republican were galvanized by what they saw as the unfair treatment of Brett Kavanaugh during his confirmation hearings, so their enthusiasm to participate now approaches what we see among Democrats." Wilson added that heavy voter turnout, especially in Texas, is thought to benefit Democrats since the party's core constituencies are less reliable mid-term voters. "There is a pattern from previous elections that is worth noting, though. Democrats seem to use early voting more than Republicans, who are more likely to vote on Election Day itself. So typically, for a Democratic candidate to win, he needs to have built himself a little cushion in the early vote to offset the likely Republican advantage in Election Day voting." Mail-in ballots must be received by 7 p.m. on Election Day (if not postmarked) or by 5 p.m. Nov. 7 (if postmarked) by 7 p.m. on Election Day. Early voting in person runs through Friday Nov. 2; Election Day is Tuesday, Nov. 6. NBC 5's Ken Kalthoff and Bonnie Moon contributed to this report.